Glaucoma is a group of diseases of the eye characterized by damage to the optic nerve, which conveys visual information in the form of electrical signals from the eye to the brain. Typically, the pathology involves abnormally high fluid pressure, known as intraocular pressure (IOP), due to excess production or impaired drainage of the aqueous humor, which is responsible for the lubricating the front part of the eye and delivering nutrition to it. If not treated in time, glaucoma can cause permanent damage to the optic nerve, loss of vision, and subsequently, blindness. Types of glaucoma include open-angle, angle closure, and congenital. Risk factors include aging, family history, and in some cases, ethnicity. Being the second most common cause of blindness in the United States, glaucoma affects one in 200 people aged 50 and younger, and one in ten over the age of 80. There is no known cure for the damage caused by glaucoma, and lack of treatment can have serious consequences, including loss of sight. On the other hand, the prognosis for treating glaucoma that is detected early is excellent. This reveals the importance of having regular and thorough eye examinations, as well as the responsibility of society to bring awareness to this problem. Tragically, many people afflicted with glaucoma, perhaps 50 percent, are not even aware of it, and many of these will become blind. Understanding the types of glaucoma requires first an understanding of the mechanics of the aqueous humor, the fluid the filling anterior chamber, the front part of the eye where it bulges out with the lens, iris, and cornea. This fluid, which is produced in the back portion of the anterior chamber behind the iris and before the lens, delivers nutrients, removes metabolic wastes, and physically supports for the eye's front portion. The aqueous humor constantly replenishes itself, replacing old fluid, which exits through the anterior chamber angle (formed where the iris and cornea meet) and eventually drains into the bloodstream. Glaucoma arises because an imbalance between the drainage and production of the aqueous humor (Windle 2005) allows a build up of pressure. The elevated pressure is associated with damage to the optic nerve, but the mechanisms of that damage are not clearly understood. One hypothesis is that the elevated pressure causes a reduced blood supply to the optic nerve. 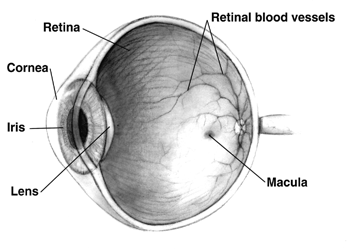 There are primarily four types of glaucoma. The most common type of glaucoma, which generally runs in one’s family, is open angle glaucoma in which, the angle between the iris and cornea gradually becomes narrow causing increased difficulties in drainage of the aqueous humor. In turn, fluid builds up causing pressure, which often leads to blind spots in the field of vision where the endings of the optic nerve have been damaged. Open angle glaucoma mostly has no symptoms. In advanced stages, there can be loss of peripheral vision (manifestation of tunnel vision). Open angle glaucoma can potentially affect both eyes at once, and if not treated could lead to blindness. A rare form of glaucoma that occurs when the iris’ position blocks the drainage of the aqueous humor fluid is called angle closure glaucoma. This is associated with a rapid and painful rise in intraocular pressure. Because of the severity, this should be treated as an emergency and the patient should be rushed to the doctor immediately. Congenital glaucoma is often hereditary and present at birth. It is the result of abnormal development of the fluid outflow channels. Surgery is required for correction. There are many kinds of secondary glaucomas, which may be cased by complications of other medical conditions like eye surgeries, advanced cataract, eye injuries, certain eye tumors, or uveitis. Tonometry - A procedure that measures intraocular pressure. Types include air-puff, where air is used to determine how much force is needed to dent the cornea, and applantation, where the eye is examined with the intense light of a slit lamp (Mayo Clinic 2006). Visual field measurement - A visual test where an object is moved to different locations on a screen while the patient concentrates on a target. The visual field is determined in this manner by tracking when the patient is able to view the target (Mayo Clinic 2006). Visual acuity - Tests the sharpness of a patient's vision using an eye chart. Refraction - Test that determines how far a patient can see. Pupillary reflex response - Tests the pupil's response to light. Optic nerve imaging - Photographs of the interior of the eye are taken for further examination. Gonioscopy - The use of a special lens to see the outflow channels of the angle. Glaucoma is an incurable disease and damage already caused by the disorder is irreversible. However, glaucoma can be controlled through continuous treatment with medicines, laser trabeculoplasty, conventional surgery, or a combination of any of these. In some cases, treatment may need to be monitored because the disease can progress or change. Medicines, eye drops and/or pills are the most common early treatments for glaucoma. Some medicines cause the eye to make less fluid. Examples include beta blockers, alpha-adrenergic agents, and carbonic anhydrase inhibitors for eye drops. Others, such as prostaglandin analogues, miotics, and epinephrine compounds, lower pressure by helping fluid drain from the eye. These medicines can cause headaches or other side effects. For example, drops may cause stinging, burning, and redness in the eyes. Treatment with a different dose or a new drug may be possible (Mayo Clinic 2006). Laser trabeculoplasty helps fluid drain out of the eye and can be recommended at any time in the diagnosis. The laser makes several evenly spaced burns that stretch the drainage holes in the meshwork. This allows the fluid to drain better. Laser surgery can cause side effects, such as inflammation. The doctor may prescribe some drops for any soreness or inflammation inside the eye. Follow-up visits are necessary to have the eye pressure monitored. Studies show that laser surgery is very good at reducing the pressure in some patients. However, its effects can wear off over time. In many cases, one has to keep taking Glaucoma drugs after this procedure. Conventional surgery makes a new opening for the fluid to leave the eye, and is performed after medicines/laser surgery has failed to control pressure. A small piece of tissue is removed to create a new channel for the fluid to drain from the eye. This procedure works best if the patient has not had previous eye surgeries, such as a cataract operation. In some instances, the vision may not be as good as it was before. Conventional surgery can cause side effects, including cataract, problems with the cornea, and inflammation or infection inside the eye. The buildup of fluid in the back of the eye may cause some patients to see shadows in their vision. Medicines can be taken in these cases. This is an original article, but some content was borrowed from Wikipedia from this version. Retrieved October 20, 2007. Feinberg, E. B. 2005. Glaucoma MedLine Plus. Retrieved October 20, 2007. Mayo Clinic Staff. 2006. Eye: Glaucoma Mayo Clinic. Retrieved October 20, 2007. Windle, M. L. 2005. Understanding glaucoma medications eMedicine. Retrieved October 20, 2007. This page was last modified on 27 August 2008, at 18:10.